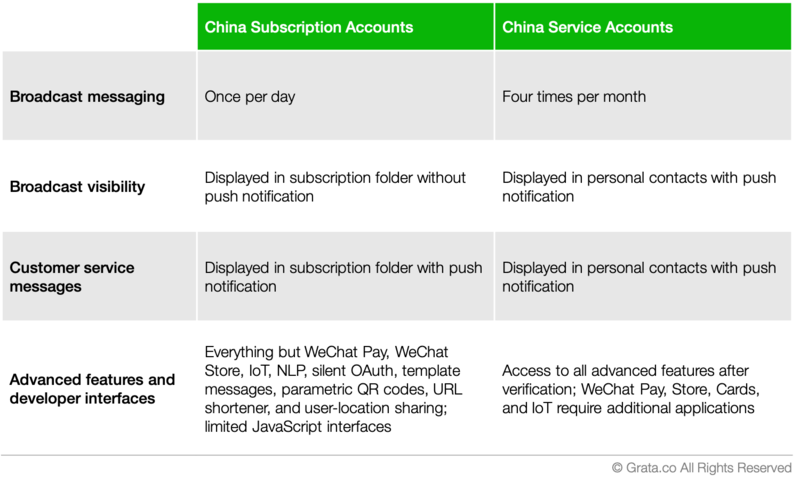 WeChat Official Accounts launched back in 2012 and, while there have been many changes over the years, one of the constants has been confusion regarding 1) how to setup an account, and 2) what type of account to register. We try to demystify both of these questions here. If you’ve been following this space for awhile, you may have noticed that the old international backend (admin.wechat.com) has been discontinued as of September 2018. This is a good thing. Accounts registered on the discontinued international backend were shockingly not visible to Chinese users. Now all WeChat Official Accounts are based on the same backend and accessible to Chinese users. That’s progress! These Overseas China Service Accounts (海外特殊认证的国内服务号) still have many limitations compared to accounts registered to Chinese entities, but they just might be good enough for what you need. Specific features and developer interfaces, and the requirements to obtain them, vary by region as they are administrated by different Tencent business development teams. 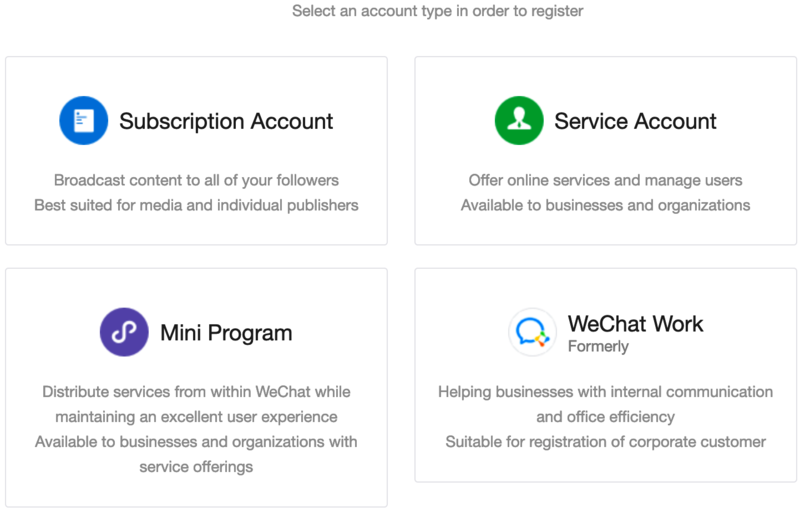 If you don’t have a Chinese business, your first step when registering an Official Account may be to consider whether or not an overseas account is good enough to accomplish what you want to do on the WeChat platform. If not, you’ll either have to register a Chinese business or try contacting a third-party agent who may be able to setup an account for you, for a fee. We recommend WalktheChat.com. Open the WeChat Official Accounts Platform homepage. It’s mostly available in English now. Click “Register now” to get started. As a Non-China entity your only choice is a Service Account. Email addresses can only be used once per Official Account, so you’ll need to submit and verify a unique email address. The drop-down list includes most countries and regions of the world with “popular” regions listed first. You’ll need to enter your company name and business registration number exactly as they appear on your local business license. You’ll also need to designate an account administrator, entering their full name and passport number, and verifying a mobile phone number. You’ll need to pick an account name, enter a short introduction to your account, and select your “operating area”. Your account is now registered! If you choose to verify your account you can start with the verification process immediately. Verification for Overseas Official Accounts costs US$99 per year. To register as a Chinese organization, you will need a Chinese business license with relevant documentation, as well as a Chinese citizen to register as the account administrator. To be clear, a China WFOE (Wholly Foreign-Owned Enterprise) is a Chinese company and can directly register WeChat Official Accounts. To begin, head to the WeChat Official Accounts Platform and click “Register now”. Decide whether to register a Subscription account (订阅号) or a Service account (服务号). We have written separately about WeChat Work accounts, that are meant for internal company use by employees and have a separate backend at work.weixin.qq.com. This article is concerned with the corporate accounts your customers will follow. The chart below covers the important high-level differences. 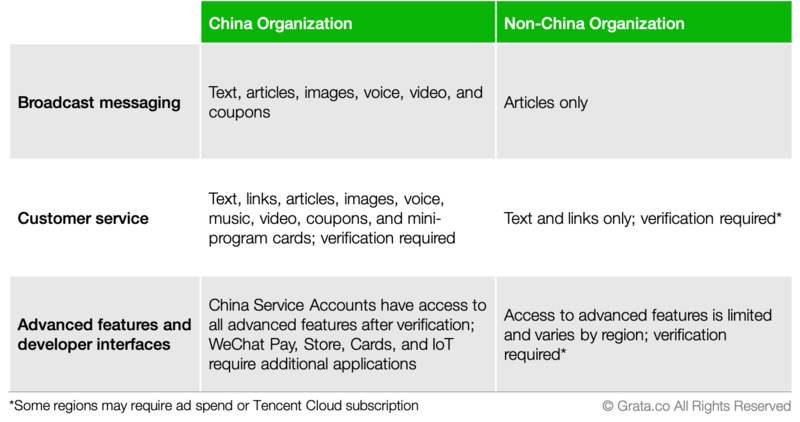 Check out our detailed overview of WeChat platform features and developer interfaces for more thorough coverage. If you’re still unsure of which account type to choose, seek advice before proceeding. Once you’ve registered your account, it is very difficult or even impossible to change types. Unless you’re a media company, we generally recommend Service accounts for our clients. Once you select your organization type (government, media, corporate, or other) the appropriate form will ask for your organization’s and account administrator’s basic information. This step requires you to register an administrator who has a Chinese national ID (身份证 shēn fèn zhèng) and a +86 mobile phone number. A short code will be sent to the phone number to authenticate. The admin will also need to scan a QR code to bind his or her WeChat account. One person can serve as the administrator for a maximum of five WeChat Official Accounts. ⚠️ Important Point: The administrator’s role is frequently misunderstood. Your business owns the account, not your admin. As the owner of a Chinese WeChat Official Account, you should control the email address and password to login to your account. As a non-Chinese citizen, you can add yourself as an operator after you register the account, and your admin will never need to be given login credentials for your account. After you’ve added yourself as an operator, you only need your admin for adding other operators, resetting your developer AppSecret, and a few other sensitive tasks. You can change your admin at any time with their cooperation, or you can remove him or her without their cooperation by re-verifying your account at any time. Your company owns the account. There are three different ways to authenticate your business. 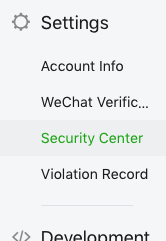 If you already intend to go one step further and verify (认证 rènzhèng) your account, go ahead and choose the last option at this step, for “WeChat Verification”, which requires a 300RMB (~US$50) annual fee. WeChat verification is the only option that provides the gold badge on your profile and access to advanced platform features and interfaces. Your account name is required to be unique. Spaces and most special characters are prohibited — only Chinese characters and alphanumeric characters. If you find someone is already using your business name, WeChat has a nifty feature that will display the account, and if you think it qualifies as trademark infringement, you can report it. If you’re curious, check out this 2014 post on how bad trademark infringement on WeChat used to be in the early days. Once set, your account name can only be changed by going through the WeChat verification process again (and paying another 300RMB). Your account logo and introduction can be changed up to five times per month. 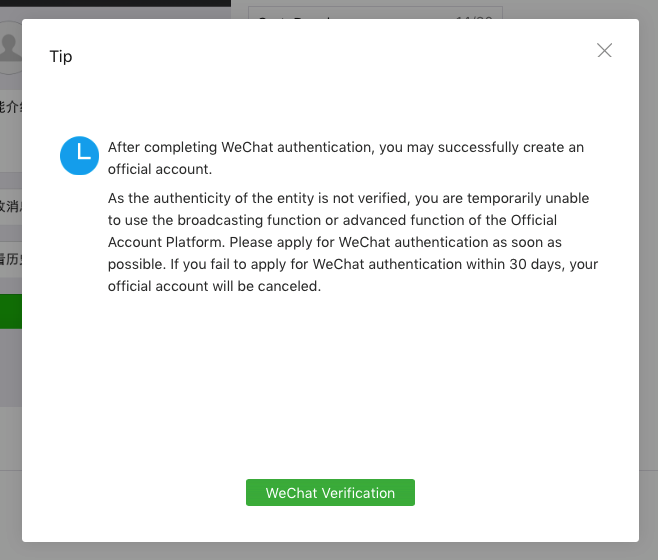 If you chose WeChat Verification as your authentication method, your account is now registered in a temporary status. You’ll need to complete the verification process within thirty days. We were able to register and verify an account for this blog post in less than twenty-four hours. 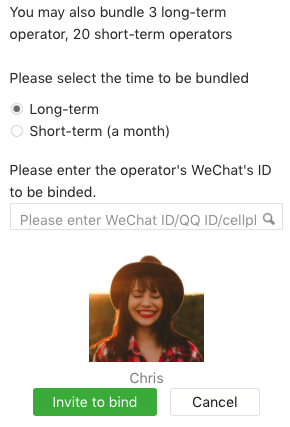 In the meantime, WeChat drops you right into your new account backend and you’ll be able to upload a profile photo and setup other basic features while you wait for verification. As discussed in grey boxed note above, if you are a non-Chinese account owner, you’ll want to add yourself as an operator so you can login without the assistance of your admin. To do this you will need to have 1) a bank card linked to your personal WeChat account, 2) you need to follow your new account, and 3) you will need your admin to scan a QR code. One personal WeChat account can be an operator for up to five WeChat Official Accounts. Get started in Settings < Security Center, and click Details on the first row. In the second section under Operator management, click on the green button to add an operator. You can have up to five long-term operators and up to twenty short-term operators (one-month expiration). A pop-up window will open and you’ll need to select your user from among your account followers. After you “Invite to bind” your admin will need to scan a QR code. Once they’ve approved, you’ll receive a template message in WeChat to accept the invite. The name of our website is different than the name of the company. Is it possible to use the name of our website for the WeChat (subscription account) name? Hi Nelik, you should be fine registering a different name. You should only run into an issue if you choose to verify the account. Currently you can verify an account name that isn’t your business license or official trademark, but WeChat won’t add the gold “verified” check mark to your logo. My firm is working with a US based client who has been attempting to register for a WeChat Official Account to provide customer support for their customers who leverage WeChat. 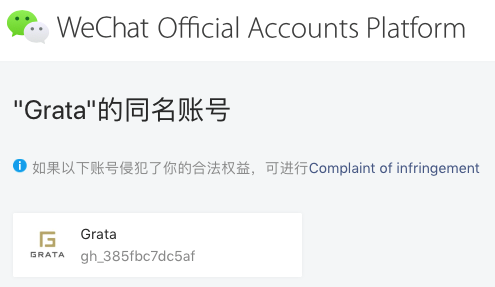 They are leveraging the process you described above for requesting an account, but have not had any response from WeChat. Do you know if the process you described above for companies outside of China is still correct? Hi Harry, we reached out to Tencent just now. Email to bd@wechat.com is still the official channel, buy mentioned the account registration process isn’t up to 100% yet. The best way is to reach out to someone on the team. Sending you an email now with a personal contact at Tencent USA that can speed things up. Also, please note from our post that international WeChat official accounts are not visible for Chinese WeiXin users. Hi there, I have applied for a wechat subscription account a month ago with no respond at all, what should I do? Hi Louise, most people aren’t getting responses at the moment. I will reach out to you through email with a private contact at WeChat that can help you register an international official account. thank you very much for your help, got your email. By the way, it always says “your application is pending verification” is this means I just need to wait? normally how long does it takes to verify? @louise han, the international application process is a bit opaque for now. Most of our clients register and verify in China, so unfortunately we don’t have a lot of data on how long it will take internationally. I would ping WeChat every week until you get a response. Good luck! oh, that very unfortunate. thanks you very much for helping! Thanks for the update, Louise. Not sure where you live, but you could try finding and contacting your local/regional WeChat office and seeing if they can speed it along. If you have any contacts or partners in China, I would consider reaching out to them to register your Official Account through their China Business License. The process is very straightforward and fast, plus Chinese OA’s are viewable to both Chinese WeiXin users and international WeChat users. Hi, I want to open an official account with WeChat for my basketball league that I am starting. I am in China but I am not a chinese citizen. However, I am a Hong Kong citizen and have a Hong Kong ID. Any idea if I can use that to open an official account as an individual using that? Also, this is not a business either so I don’t have a “fixed-line” telephone either. Any help will be appreciated. I’ve already emailed to support@wechat.com and still waiting on a response from them. TIA! Hi @iablcn, you cannot use a Hong Kong ID. If you are in China, I would suggest getting a Chinese friend in your club to register an individual account under his/her name. You can still control the email and password if you are worried about this. If the form forces you to list a fixed-line, try an office number or something. It will rarely, if ever, be used to contact you; just a formality. Thanks! I appreciate the quick reply! grata for some reason i cannot continue conversation on my post from phone. I just want to let you know that i finally got the account! You can ask people email me,i can get their account for them! Good luck everyone! Can an business that is located outside of China use a Chinese partner register on their behalf in order to overcome the above ? @Joel, this generally is not a problem. We recommend that our international clients take this route. If you have access to a partner’s Chinese business license and other Chinese documents, registration should not be a problem. You can take control of the account with your own email address and password after registration. Later steps, including verification, payments, and online store require additional documents and a bit closer scrutiny, so try to consider your long-term WeChat strategy and make sure your partner can support those later steps if needed. If you want to verify your account under a name that you have no Chinese documentation for (license/trademark/etc) you will not be able to get a gold badge on your profile, but you still can get access to verified account features and tools if that is important. Thanks for that. One last question, if you use a partner to do the registration, can they also deregister your account ? Is there any documentation you are aware of that talks about deregistering ? Hi there, I have applied for a wechat subscription account a week ago with no respond at all, what should I do? Hi Joey, although bd@wechat.com is still the official channel, it doesn’t appear that WeChat is really responding to emails. There are a few agents that will register official accounts for you in China, you can find them with a quick search online. Alternatively, if WeChat has an office in your home country, try to reach out to them through another channel. What do I search for to find these agents? I assume it’s not a free service? Hi Roger, they aren’t as easy to find as I had assumed. I found one yesterday that I will send you by email. I don’t want to post them here and give an appearance of endorsement, as we haven’t tested any of them. I am interested in learning more about the possibility of my mainland-licensed service-business offering and managing official mainland accounts for my non-mainland clients. What insights do you have on the required “scope” necessary for approval or limitations/restrictions for third party management of official accounts? I don’t see a valid email address from your profile. Please send us a note at info@grata.co. Hi there, we are an Asian contemporary Art gallery in Sydney. We would like to open an official Wechat platform. However, we do not have Chinese ID and Chinese business licence. How could we open an official Wechat platform? Hi Emily, you will need to either apply for an international official account or find a Chinese business you work with to help you register one. The website link you provided, http://apply.wechat.com/, does not look like an official website from WeChat: there is no contact info, no copy right info, no Chinese language option… frankly, it looks like a fake website designed to trap businesses into given them your important information. Please, investigate this carefully! I’ve searched all of my resources and can NOT confirm it as a valid website. I highly recommend you delete this link and avoid them. There are numerous reports of scams and phishers who are emulating valid websites – such as WeChat’s English website, so you’ll want to be careful. Hi, Lesley. Thanks for your concern. That website was provided to us directly from a personal contact at Tencent. Tencent runs the China version, WeiXin, and the international WeChat separately. All China registration is through a separate site. While there isn’t a lot of support yet for international official account registration, this is the official English language portal. lesley… apply.wechat.com is on wechat.com domain… how can it be fake if it’s right on wechat.com…. Hi, I want to register a wechat official account for personal use. My purpose is to promote some items to my customers and followers. How do i get it done? I’m a Malaysian. Hi, Kim, follow the steps outlined for international accounts above. There is no guarantee you will hear anything back from WeChat. We just added a few more suggestions for people that aren’t getting a response from WeChat. Good luck! 1. what are the differences to use international official account and chinese official account? Basically i would like to know what are the differences using international official account vs chinese official account. Hi Vincent, the short answer is: if you can get one, a Chinese Official Account (OA) is much more valuable. The main difference being that Chinese users of WeiXin cannot access international OAs, while Chinese OAs are accessible to both Chinese and international WeChat users. Chinese OAs also have access to slightly more features, such as payments. You will need to understand Chinese to apply and manage your Chinese OA, however. Otherwise, the accounts operate quite similarly. Hope that helps. i’ve already submitted the proposal for my company official account. but i didnt get the application number at the end, what do you think that mean? is that normal? or should i re-register again? Thanks for your help!! We can’t really speak for WeChat on that. Try contacting them through email or Facebook for assistance. Should the license scans be watermarked? Chop everything here. Not sure exactly what you are referring to with a watermark. If you are worried about improper use of your business license or personal ID, I have seen people add Chinese text over their scans saying “For the purposes of WeChat Registration Only” or something to that effect. @Manlaw, I’m not sure I understand. You can only link your phone number to one WeChat individual account, and you can only log-in on your phone to one WeChat account at a time. You can register multiple official accounts with one phone number, but the official accounts have little to do with the phone number used. With the official accounts you can use 3rd party software, like Grata, to have multiple customer service agents online having one-to-one conversations with your customers. If you just want to make personal customer appointments, one individual WeChat account should be fine and you can converse one-to-one with an unlimited number of contacts. Does that help? Hi Grata. May I know is there any fees that we need to pay to open an official account or public account in Malaysia? Hope to hear from you soon. Registering an official account should be free unless you use a third-party agent. We haven’t heard yet if WeChat has started charging international accounts for verification. Chinese Official Accounts pay 300RMB (~US$50) per year for verification. 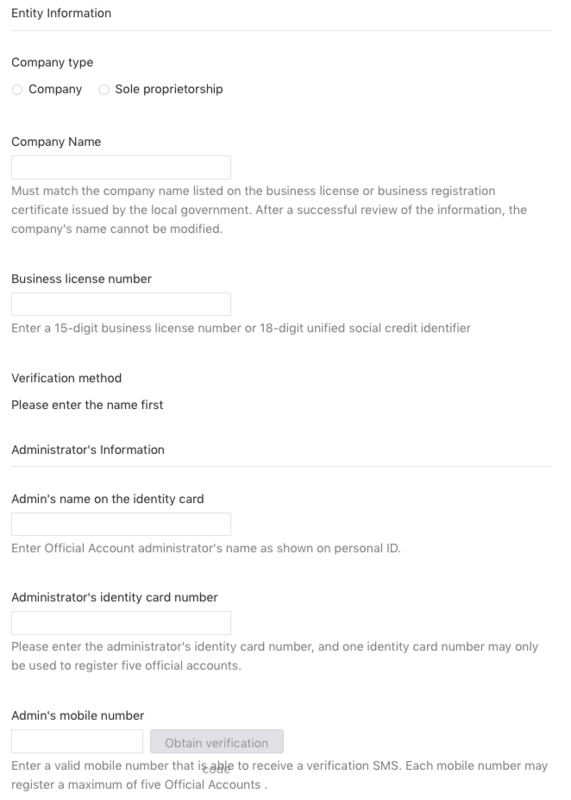 Hi, Can i follow the steps given in this post if i want to register an official account from Singapore? Hi Brenda, yes this post is up to date for registering accounts outside of China. You may find it helpful to seek out an agent to help you register an account if you’re not getting a response from WeChat through normal channels. What we haven’t found is any legitimate agents offering international businesses a channel to register Chinese accounts. Hi there! I am actually studying about WeCHat Official Account and saw this post! I personally use WeChat in the Philippines to keep in touch with my friends. I’ll appreciate any help from you on how I can create and setup a WeCHat Official Account outside China. Thanks! Hi Dyza, there aren’t any shortcuts that we know. Go to apply.wechat.com and see if you get a response. Let us know, as we get lots of questions about international OAs. what kind of proposal need do have sample? Hi Marcus, I haven’t seen any samples. From what Tencent has told us, they are mainly looking for established brands or innovative use-cases in the beginning. Hopefully it opens up more broadly to international accounts soon, similar to how it is in China. I know this post is almost one year old already, but I am confronting the same problem as others did. Registered and waited it pending for a month already….and I have just sent an email to the two email links you offered. according to your experience, Is there anything I shall do in the mean time? Hi Leo, we can’t offer much more advice than what you see in the comments. If your application is stalled, our recommendation would be to reach out to the local country team via any channel you can find (e.g. Facebook) and try to push them for support. Good luck! Hi I want to register a personal public account but don’t have a Chinese ID? – How do I do that? Hi Lisa, as far as we can tell this is still true. We’ve come across a couple OAs that look like exceptions to the rule (eg. Monash University ID:MonashUniAus, Zalando Italia ID:Zalando_Italia), but otherwise no sign that anything has changed. We heard from Tencent — this was over a year ago — that it was unlikely this would ever change as this is coming from the government. Hi Lisa, if you want to do it for China you could get a Chinese friend to register one for you. Personal official accounts are not available for international accounts, only in China. Hi Aurora, as far as we can tell this is still true. We’ve come across a couple OAs that look like exceptions to the rule (eg. Monash University ID:MonashUniAus, Zalando Italia ID:Zalando_Italia), but otherwise no sign that anything has changed. We heard from Tencent — this was over a year ago — that it was unlikely this would ever change as this is coming from the government. I would like to know what are the differences between the service and enterprise account. And is there any possibilities to change the account type to service account if I apply wrongly for my company account as subscription account? Enterprise Accounts are internal corporate accounts that give companies more control over who can follow their account and what data can be shared, etc. Service and Subscription accounts are externally facing accounts. For some companies that registered as a subscription account, there is an option to upgrade to a service account — look on the account page in the row that states your account type; if you can upgrade you should see hyperlink text in that row. hi, I’m in Australia, can I register a subscription public account as individual? will the driver’s licence enough for application? Hi Yu, you would need to register an international official account through apply.wechat.com, but I don’t believe they support OA’s registered to individuals. You can try, but I doubt you’ll hear anything back from WeChat. We have apply the official account outside china using http://apply.wechat.com/ .But it still no response after 2 week, we have tried email bd@wechat.com and oa@wechat.com as well, but no response. Is it any other way for me to register a wechat official account beside using this method? By the way, when i apply through http://apply.wechat.com/ , can i apply as an individual, not as company? Hi, I applied through http://apply.wechat.com/ about 3 weeks ago – still pending verification. I am actually based in Shanghai but am a UK citizen. I have a personal wechat account. What is the quickest way I can set up a corporate subscriptions account? My company is a Uk company, but we are trading with China. Is there any contact email address I can use to speed up the process. 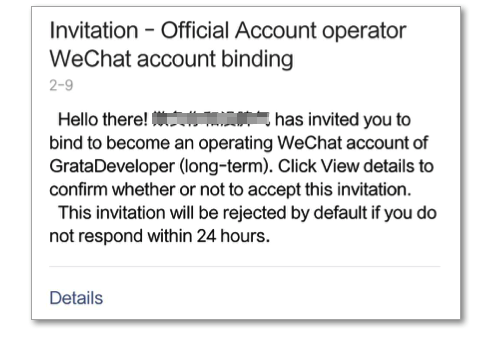 Oliver, you don’t want an international Official Account (via apply.wechat.com). This will not be accessible to any Chinese WeChat users. 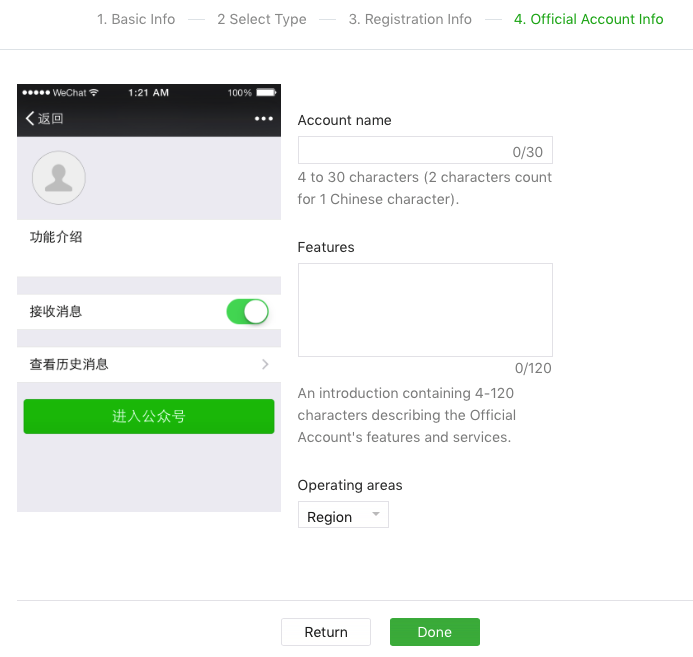 You want to register a Chinese WeChat Official Account (via mp.weixin.qq.com). If you don’t have a Chinese business license you could consider registering an individual Official Account through a Chinese citizen. what if the Chinese person (for example the Chinese employee dealing with digital marketing for the company) which used his/her ID card for the OA registration leaves the company? Does he/she has the power to delete the official account? I don’t believe there’s any way to actually delete an official account, but anyone with access to your account could obviously do some damage. To your question: you are able to change the Chinese admin for your account if they leave your company so this shouldn’t be a problem in most cases. 1) when relying on a chinese partner to create an official account, is it possibe to avoid that the Chinese partner´s name is displayed in the “type” section? it looks pretty bad for the brand identity of a company. 2)you say it´s impossible to delete an official account? what if the owner wants to dismiss it? 3) is Monash University a personal public account? i see they have a menu and my understanding is that personal public accounts can never get a customised menu. I have been asked to verify myself to join a group by giving my complete credit card information linked to my bank account. Is this standard for joining a group of more than 100 people? Hi Cheryl, yes, WeChat will require you to add a payment method to WeChat in order to join chat groups of more than 100 people. You mentioned that with any Chinese ID I can create two accounts. Does that also apply for the same company? For example I use all the same registration information and ID for applying for a new account (weixin – not wechat) and the only thing that changed is that teh display name is the international name and the content of the wechat account and all publications, notifications … is going to be in english. Or is it possible to have one account but bilingual? Hi Judith, it is possible to have one account be setup to be bilingual, but it will require you to use the WeChat developer interfaces/APIs as this is not stock WeChat functionality. You could choose a bilingual name and display different menus, notifications, and articles to users depending on their language. We would normally recommend business manage only one account, but you are able to register multiple accounts with different names to the same business license. Sorry we don’t have better news for you. 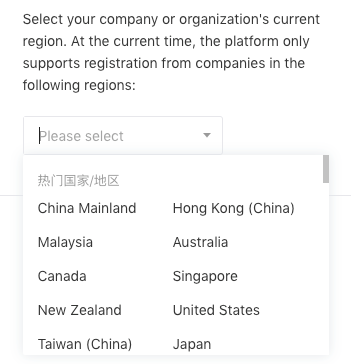 As we’ve mentioned in previous comments, WeChat International only seems to be interested in Official Accounts for major brands and some special regions (Malaysia, Singapore, HK, South Africa, etc). If you really need to get an account, your best bet is getting a Chinese business license and registering a Chinese Official Account. hi is there a difference between the chinese version used in china and the international version? and if there is, is there any way I can try out the Chinese original version abroad without a chinese phone number? I think you’re referring to the actual WeChat app, right? The app is the same, but depending on your language, region, and mobile phone country code, you may see different content. You can fake this for some features to see different content. Try setting your user location to Guangzhou (where WeChat is headquartered) and your language to Chinese and you should be able to see things like the City Services and other features. hi, i wanted to apply official account but this website is totally Chinese. don’t you have English website for foreigners ? and we are hong kong company which license to apply? thanks for your reply, we have hong kong company license, and we do have REP office in china, so can we use our rep office license? and mp.weixin.qq.com is fully in Chinese, do they have change language option ? thanks for your reply, and we do have REP office in china, so can we use our rep office license? and mp.weixin.qq.com is fully in Chinese, do they have change language option ? 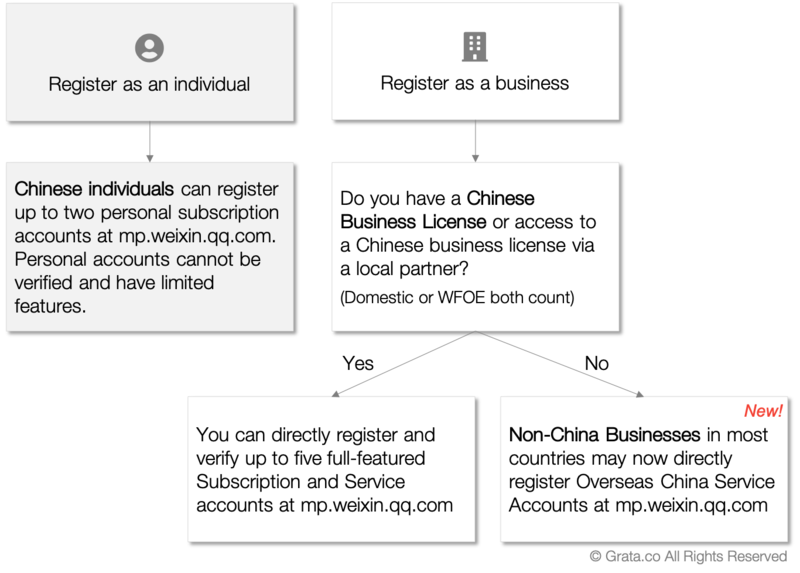 You are able to register Official Accounts to a Chinese rep office, but there is currently only Chinese language support available for Chinese Official Accounts at mp.weixin.qq.com. Hello, im trying to help an art gallery in hong kong to open an official chinese wechat account. we have hong kong id and business license. ive read that hong kong id isn’t accepted, however is hong kong business license fine? WeChat used to allow HK businesses register Chinese Official Accounts, but we have heard this is no longer the case. You would only be able to register an international official account with a HK business license, which would not be visible to Chinese users. Hi Carter, you aren’t able to change ownership of official accounts as far as we’ve seen. There is also no automated way to move followers from one official account to another. If you wanted to switch to a new account registered to your business license, you would only be able to request your current followers to follow your new account. How do I control who can or cannot subscribe to my official account? WeChat Subscription and Service accounts are not able to restrict people from following them. If you want to exclude certain users from receiving your outbound content marketing, you can put users in a “blacklist” group and choose not to send it to them when posting content. WeChat Enterprise accounts, however, are designed for internal use, so you are able to control who can follow your enterprise account and eject followers as needed. Pingback: Is WeChat Wallet The Strongest Mobile Wallet Available?